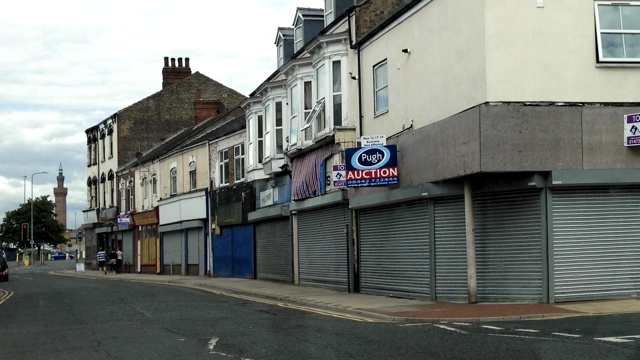 Nick Boles recent suggestion that empty retail be more easily converted into residential property left me somewhat conflicted: part of me felt he was right, local authorities should be able to do what they want with their local plans. Yet a bigger part of me couldn’t help thinking our town centres and high streets need protecting and developing, they need champions not quitters. Admittedly my feelings were coloured by the fact I was visiting my family in the Grimsby area when I heard it, going through the predictable bout of depression I experience upon seeing how my home town has declined. Feeling, as I always do, a strong sense that the local council has brought about a lot of that decline with planning policies that lack vision or purpose. Like so many areas, the town had its historic heart ripped out during that awful period of the fifties and sixties when the artifices of Victorian success were demolished in favour of modern brutalist architecture. Grimsby compounded this in eighties and nineties by developing the brutalist town centre into a more modern covered mall, but one which had blank walls around the outside, as if to emphasise how it had turned its back on the old working buildings that overlooked it across a small river and the docks. If destroying the old wasn’t enough, even the relatively modern now gets a kicking, with the town’s second huge Tesco Extra allowed to open just a few minutes from a main shopping mall that now seems to have died a little more each time I visit: its death throes marked by each addition of a discount store. Listening to the local radio the council’s leader took the opportunity to criticise the government which had, a few years ago, rejected plans to turn a major portion of one of the traditional shopping streets into residential property. In doing so he made me think that, perhaps, the government was right to protect the area from the plans of local politicians. Instinctively his idea seemed wrong. Taking what was once a major shopping road and market (as a child I took part in twice-weekly expeditions with my mother and grandmother to hunt for fruit, vegetables and meat) in what is one of the most deprived areas in the country where a little over half the residents are dependent on benefits1 their plan was sacrifice employment space in favour of housing in an area that has no housing shortage. Thinking there must be more to the plans I looked them up, but my investigations found little else. They have pretty pictures of how they might look–still featuring vacant units–but it all seems rather predicated on an idea that if you build it, they will come. Indeed, one of the plans accepts that they might not want to come (PDF), so suggests some of the demolished buildings could just become park until the demand was there. Good buildings make a difference but without any vision I fail to see how what difference nice buildings in a consolidated retail area would make. Unless the goal is to create a slightly smaller high street to fail. I recognise that even my combined hometown nostalgia, continued reading of the Grimsby Evening Telegraph and frustrating support of GTFC does not equate to expertise of the social and economic needs of the town. That said, every time I visit I cannot help feeling it is a place let down by a lack of imagination and sense of place from those in charge. Only time will tell if I’m right about Grimsby and, for that matter, if I’m right about Wandsworth. But when you allow new buildings to turn their back on your architectural assets, create overwhelming competition a short dawdle from your main retail centre, or even remove employment space from one of the country’s most deprived areas it’s hard to see how time can ever be your friend.